Earnings are expected to fall, though the nation’s biggest bank by assets could still beat analyst expectations. The second quarter isn't going to give investors in JPMorgan Chase (NYSE:JPM) much to write home about, as analysts are predicting that earnings at the nation's biggest banks will fall in the three months ended June 30. Among 28 analysts who track JPMorgan Chase, the consensus estimate is that its earnings per share will drop by 7% in the second quarter. It earned $1.54 a share in the year-ago period but is expected to bring in only $1.43 a share this year. If analysts are right, it will mark the second consecutive quarter in which JPMorgan Chase's net income has contracted on a year-over-year basis. It earned $5.5 billion in the first quarter, which is certainly nothing to shake a stick at. But it was nevertheless meaningfully less than the $5.9 billion it earned in the first quarter of 2015. The problem for banks right now is threefold. First, concerns about slowing economic growth in China, stubbornly low oil and gas prices, and the United Kingdom's pending departure from the European Union have spurred volatility in asset markets. This reduces revenue in JPMorgan Chase's capital markets divisions -- its trading and investment banking units. As a market maker and an advisor to companies that want to issue debt or equity, JPMorgan Chase earns commissions when its clients buy or sell products in the capital markets -- things like stocks and bonds. But heightened volatility causes many of these clients to stay on the sidelines, thereby weighing on JPMorgan's noninterest income. We got a taste for this in the first quarter. The New York-based bank's trading revenue fell by 11% in the three months ended March 31. And fees from investment banking declined by 25%. The good news is that there's reason to believe that trading revenues across the industry won't be as bad this quarter. Jefferies Group, an investment bank owned by Leucadia National, reported last month that its sales and trading revenue increased on a year-over-year basis by 21% in the three months ended May 31. Additionally, the head of JPMorgan Chase's investment bank, Daniel Pinto, said at a recent industry conference that trading revenue should climb by the mid-teens percentage in the second quarter. The question now, in turn, is whether or not the vote in favor of the Brexit on June 23 will have upset the markets enough to erase these gains. This seems unlikely, given how late in the quarter the Brexit vote occurred -- though there's little question that it will serve as a headwind for the rest of the year. A second problem banks are confronting are higher loan losses from their energy portfolios. In the first quarter, JPMorgan Chase nearly doubled the amount of money that it sets aside to cover future loan losses, recording a $1.8 billion provision compared to $959 million in the year-ago period. As the bank noted in its press release, the move "reflected an increase in wholesale reserves of $713 million, primarily driven by downgrades, including $529 million in Oil & Gas and Natural Gas Pipelines, and $162 million in Metals & Mining." The situation looked particularly dire earlier in the year, as oil prices briefly dipped below $30 a barrel. 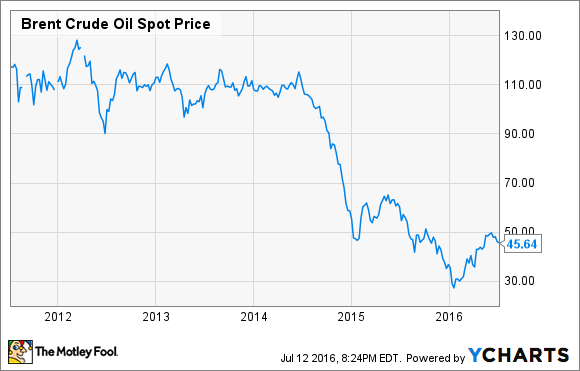 They've since recovered to around $45 a barrel, but that's still 21% lower than they were at this time last year. It thus seems reasonable to assume that JPMorgan Chase's loan loss provisions will stay elevated, as the bank has predicted. Finally, all banks are laboring against unprecedentedly low interest rates, which weigh on bank earnings by reducing income earned from loan and securities portfolios. While the Federal Reserve was on the verge of raising rates earlier this year, and in fact inched them up by 0.25% last December, it's since abandoned any pretense of further increases. All banks would benefit from higher rates, but in JPMorgan Chase's case a mere 100-basis-point increase would translate into an estimated $3 billion in additional net interest income. This would go a long way toward helping the nation's biggest bank by assets get its return on equity above the 10% threshold that most banks strive to exceed -- its ROE over the last two quarters was 9%. In sum, banks are navigating a very inhospitable environment right now, essentially marooned on an island waiting until the weather clears. The silver lining is that shares of JPMorgan Chase are yielding 3.1%, which offers a tempting target to income-seeking investors.